I received a free book and voluntarily chose to review it. This author’s series of Retold fairy tales are a joy to read. If you have read some of the others, you may notice that some previous names are mentioned in this one. Probably, a way for the author to get you to read all of the Retold tales. It works for me. I have enjoyed all of the stories with their romance and suspense. Another great fairytale retelling from Demelza Carlton! A curse, an innocent heroine, her good-for-nothing brothers, a humble shoemaker hero, a fairy godmother, all blend together to deliver an excellent story of love and retribution. The story is full of excellent twists, plenty of action and adventure, magic and romance. The storyline builds slowly and aspects of the story are revealed gradually, holding the reader captivated. 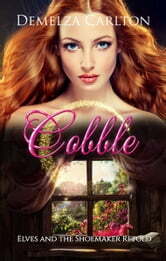 A real page turner of a quick read, perfect for fans of fairytale retellings!!! I received this book before publication for the purpose of reviewing it. This is a retelling of the classic story The Shoemaker and the Elves. I thorough enjoyed the author’s take on this story. The nostalgic feel of the original fairytale is still there, but it is a completely new story. The heroine is well written and all of the characters are nuanced. I have enjoyed the previous books in this series and I look forward to future works by this author.